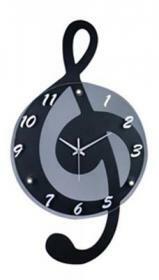 This cleverly designed Treble Clef Clock measures 12" wide x 21" high x 2" in depth. A Great conversation piece for your Music Teacher's studio....or your music room...orany room ineed of a clock. One of our most popular time pieces to grace your wall.